The body of work made me pause. I feel it’s a good and easy read to help remind us all of how to behave. Getting the magic in there with my puppet genie! I’m a member of the local rock club. What we call our annual fundraiser is in the form of the annual rock and mineral show, which I am an active participant. One of the attractions is the stage’s display cases. All club members are encouraged to come up with a display of their choosing. The stage will hold about 15 cases, sized roughly 3 x 2ft. Our club does not have many rules or regulations in regards to these displays. Geological location, different forms of a specimen, how to make cabochons, rough verses tumbled, are the common themes running throughout. 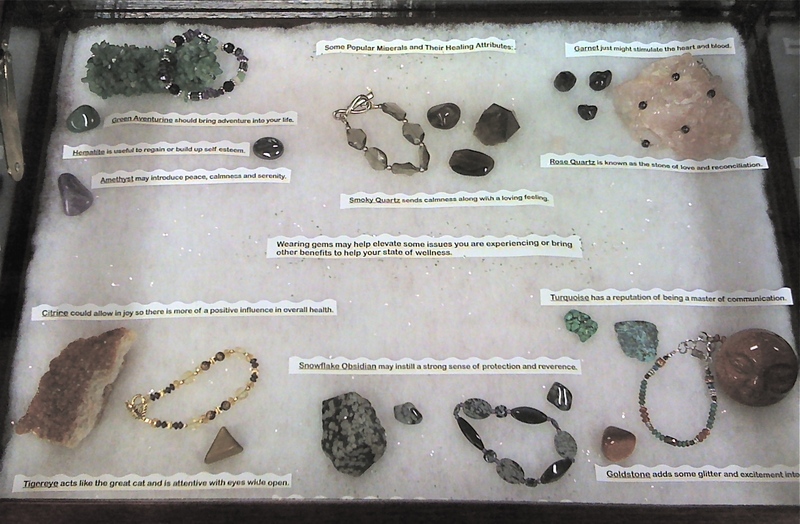 This is the first display case showing the minerals and beads threaded into bracelets. 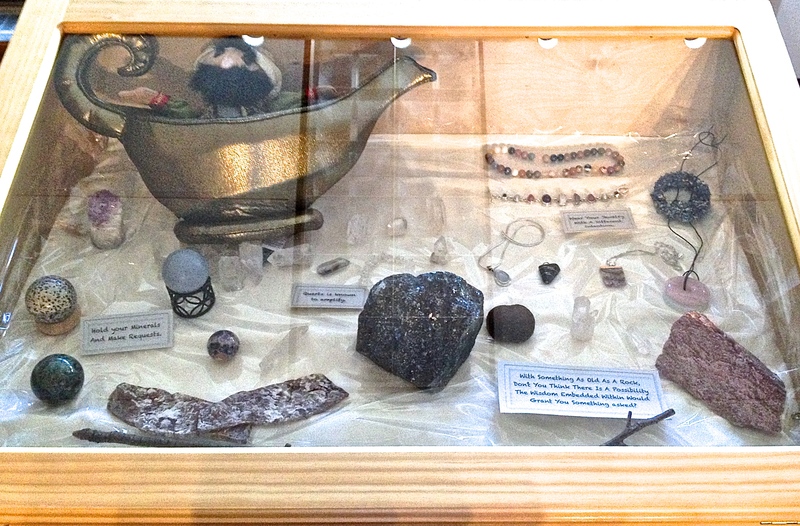 About 4 years ago, I was asked to create a display featuring the metaphysical angle of rock collecting. Open talk about collecting crystals for the soul purpose of using them in energy work or other crafts was not commonly heard at meetings. Because of my beliefs and needing offer other possible modalities to help one another, I agreed. My display case was the first to have metaphysical properties listed and I have been putting one together every year since then. Unfortunately, I don’t always remember to take a picture, so I just have two.